Summer has settled in! Temperatures are creeping up, and in some parts of the country, they are soaring into the triple digits. In times of extreme heat, it’s especially important to protect our elderly loved ones. At FirstLight Home Care, our mission is to keep seniors safe, healthy and happy in any conditions. If you or an elderly loved one must be in the heat this summer, here are 7 sun safety tips to help you stay safe and cool. 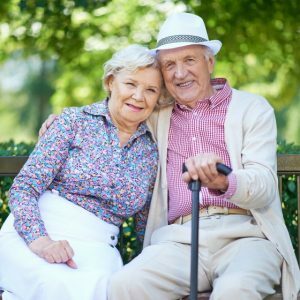 Put on Proper Clothing: The best summertime clothing for seniors is something loose, lightweight and made of a breathable fabric. Light colors are also best. Long sleeves can protect skin against the sun. And wide-brimmed hats protect your face and neck. Wear Sunscreen: Look for a broad-spectrum sunscreen that protects against both UVA and UVB rays, and one that is sweatproof or waterproof. Remember that sunscreen takes time to work, so don’t wait until you are outside to apply. Ideally, you should put on sunscreen about an hour before you head outdoors and re-apply every two hours. Keep Cool: Even small increases in temperature can affect seniors who are coping with chronic medical conditions. Seniors should stay inside the home in a cool room during the heat of the day. If a senior’s own home isn’t air-conditioned, shopping malls, movie theaters, libraries or a friend’s house provide welcome, cool spaces. Drink Up: The feeling of thirst decreases as we age, so seniors are less likely to feel thirsty. Dehydration can come on quickly and it can be dangerous. The goal should always be to drink between 6 and 8 glasses of water per day and to increase water intake if participating in any kind of physical activity, or if the weather is particularly hot. Wear Your Specs: As we age, our eyes become more sensitive. Wearing sunglasses can help reduce the cumulative damage that causes eye problems, such as cataracts and age-related macular degeneration in seniors. Wrap-around styles that protect from both UVA and UVB rays are best. Avoid Heat Stroke: The sun is most intense during the middle of the day. If you or your senior loved one enjoys outdoor activities, try to do them in the morning. If you are out and about on a hot summer day, it’s extremely important to watch for signs of heat stroke, especially in seniors. Some signs to look for include confusion; disorientation; red, hot and dry skin; headache; lethargy; nausea; and a rapid heartbeat. If you or someone you know experiences these symptoms, seek medical attention immediately. Check Your Meds: A large percentage of seniors take medications daily. These meds might cause an increased sensitivity to the sun. It’s important to review all the medications you’re taking and talk with your doctor about any concerns or questions you have about how the sun and heat might interact with them. If the summer heat is rising where you live, share your tips and advice on how you’re staying cool on our Facebook page. If you have specific questions about caregiving or the health and safety of seniors, please reach out and Ask Our Nurse.